After Randy Lerner gave Paul Lambert a public vote of confidence after Aston Villa twice slipped-up against lower league opposition in the cups, the Villa chairman has apparently took the unprecedented step of sending a more public and direct message from the stands to his manager during the crunch game against Newcastle United at Villa Park. 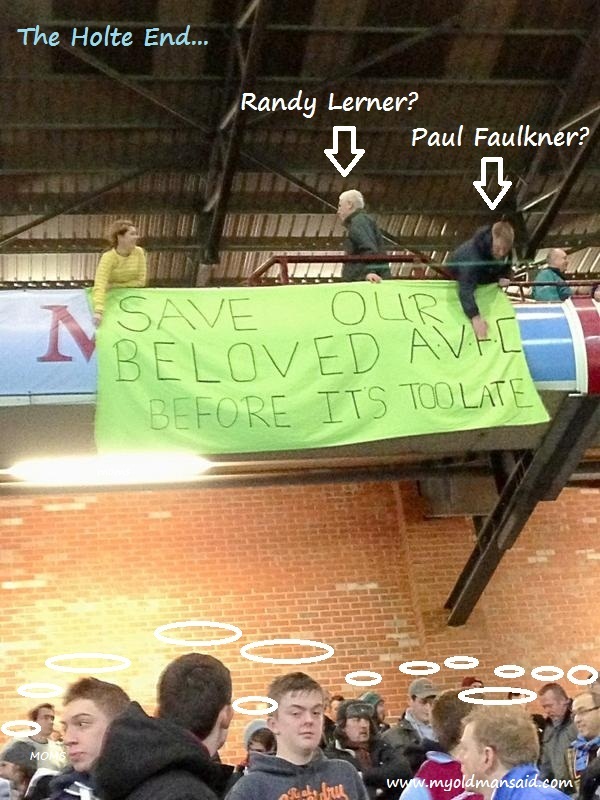 From the below photographic evidence, it seems Lerner enlisted the help of his Chief Exec Paul Faulkner, with the duo hanging a large banner message to the Villa manager from the Holte End, as Villa supporters – who have collectively exercised the patience of a saint watching their team’s woeful home form – looked on, oblivious to their chairman’s antics above. The surfacing of the below photo seems to tie-in with the recent reports from Italian leisure wear makers Macron of the theft of a roll of the luminous green fabric used to make Aston Villa’s away shirts. With no sign of breaking and entry, Macron had suspected it to be an inside job. Is this Lerner and Faulkner sending a glow in the dark message to Lambert? If true, it would seem on the evidence of this photo, that the Villa board instead of trying to strengthen in the January window to fight relegation, are more interested in passing the buck. Four months to go, but is it already too late for our beloved AVFC? *A Venglos View is a satirical look at Villa.